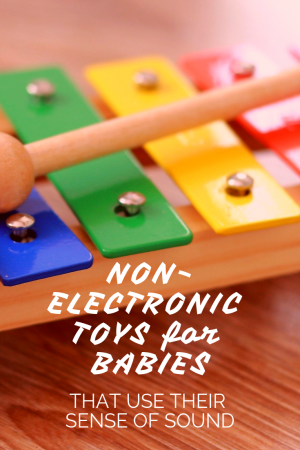 Best Non-Electronic Toys for Babies (that use their sense of sound) ~ SOUND IS FUN! Acoustic toys can be good for motor skills because babies have to move them to create sound. For some toy types, I’ve included a popular toy option and a wood/Montessori option. 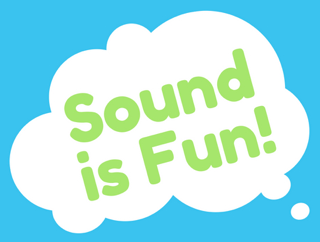 The sound will differ between the two so if you don’t have a preference towards one type, you could try both – especially if it’s a style of toy or sound your baby really likes. Homi Baby RattleRattles (or Maracas) are great for babies who still have the grasp reflex (under six months) because it’s easy to hang onto. It’s a toy that will keep a baby’s interest as they get older – especially once they learn cause and effect. Fisher-Price Rattle ‘n Rock Maracas come in pairs and are vibrant colors that babies are attracted to. If you’re sewing-savvy, there’s a lot of how-tos online to make a crinkle blanket or crinkle paper. Crinkle books are great, too, if you’re looking to get an early start on reading. Shakers come in a lot of colors, styles, and options. There’s traditional egg shakers or more playful designs (like the Skip Hop Explore and More Musical Egg Shaker Trio) . Shakers would be best for babies over six months who can grab, hold, and shake an object pretty well. Bells are another common sound found in baby toys. For infants, it’s safest to choose toys with bells inside the toy (so there’s less risk of swallowing) like the Hohner Kids / 5″ Handled Cage Bell. The rattle-style bells are great for under 6 months. Once a baby starts moving around, a ball (like the Bendy Ball might be more appealing). Babies love exploring real pianos if you have the chance but in the meantime, Little Tikes Tap-A-Tune Piano has large keys so is easy to play. It’s a toy that can last into toddlerhood (and toddlers love music toys). Montessori/wood option: Hape Pound & Tap Bench with Slide Out Xylophone. This is cool because it’s a music instrument that doubles as a pounding toy. Toys with lots of different sounds! Look for toys that incorporate multiple types of sounds (crinkling, shakers, bells, squeaking). Lamaze’s Jacque The Peacock was my son’s favorite with it’s crinkly wings and squeaker (Freddie the Firefly is very similar in sound). The Developmental Caterpillar by Kids Preferred has bells, rattles, squeaking and crinkling. These kinds of toys are great for activity gyms/playmats, in the stroller or in the car.